Our template editor now supports different languages, meaning your campaigns can be sent to users around the world with minimal extra work on your part. Your multi-language campaigns can include email, push notifications and SMS in as many languages that are necessary. Localization is important to global brands who want to send the messages to their users in their native language. Because it’s the same message, all versions of that template share the same campaign ID for easy reporting and metrics. It’s simple to get started using this feature with your projects. Here, you can add as many locales as you need. These locales can be called whatever you like as long as they match exactly what you add to your user profiles. However, an easy best practice would be to use the two-letter ISO country codes. You can see in our example, we use English (en), French (fr), German (de), and Spanish (es). 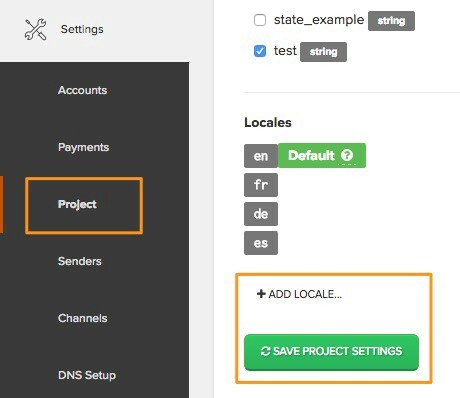 After you’ve added all of your desired locales, be sure to save the project settings. 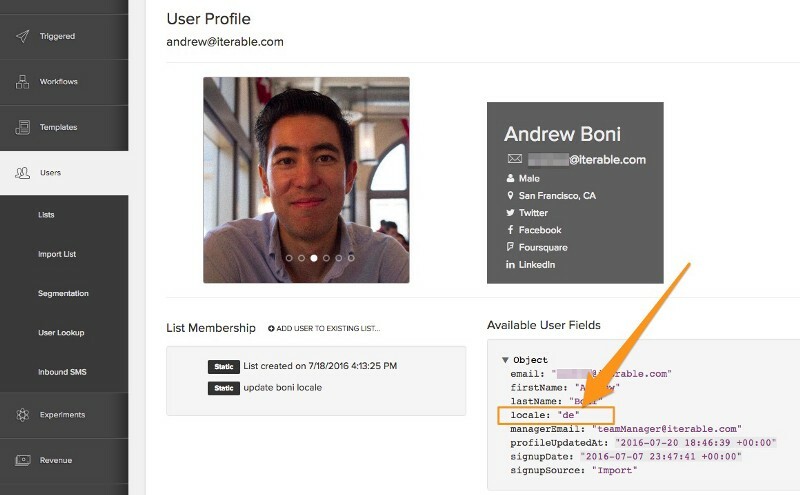 Then, update your user profiles with this new field (via API call or CSV upload). In the future, any template you create or edit will have a Locales box in the top right corner. You don’t have to do anything for this to appear on every template. Each of your locales will be displayed in that drop down box. If you want to edit a particular language version, just select it and edit the template as you normally would. Saving the template after adjusting a locale will append a green "Exists" to the locale in the dropdown. It should be noted that this is not a language translator. You’ll need to input the template content for each language. Also, remember to always save your work between editing versions. Once you’re happy with each of your versions and have tested proofs, the correct version will be sent to the appropriate user based on the locale field specified. If there is no locale set for a particular user, then they will receive the default template at send time. If a user does have a locale set, but it does not match any of the locales that have been created on the template, then they will be excluded from any sends. Many Iterable customers take advantage of the Iterable Experiments (A/B testing) capabilities. Now, each variation in your test will also have a locale version. Experimentation will work the exact same way as before, choosing a winning variation to send to all of your users in their appropriate language. The new Locales feature eliminates the need to filter users by location or language in your workflows since they’ll receive versions of the same campaign (and same campaign ID). When reviewing your individual campaign details and metrics, you’ll be able to see how many locales that campaign was sent to. And you’ll also be able to see how many locales a particular template has associated with it.